Hayden Lake has long been renowned for the beauty of its clear, cool water, sandy lake-bottom, and abundant aquatic life. Across more than a century of shoreline development, residents’ concern for the future of this unspoiled beauty has persisted. Multiple studies spanning two decades recognize the unique quality of Hayden Lake. These studies also confirm that lake water quality was and is threatened by our interactions with the watershed. The US EPA National Eutrophication Survey ranked it among the highest quality lakes in the state in 1977 and in 2019, Hayden Lake still looks and feels pristine. 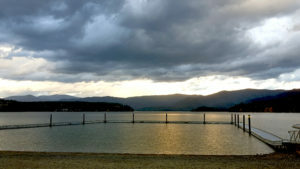 Even so, researchers and state officials recognized that the influence of human activity within the watershed would shift the status of the lake faster than Mother Nature would on her own. At issue is the increasing concentration of the plant-supporting nutrients nitrogen and phosphorus in the water. Because of this, one of Idaho’s designated Outstanding Resource Waters carries the label of impaired or water-quality limited. A 1985 detailed analysis of the lake confirmed earlier concerns and identified sources of nutrient loading or input. From the study data, local and state stakeholders developed a Lake Management Plan. This plan led to the state DEQ approval of a Phosphorus TMDL (Total Maximum Daily Load) of 10 micrograms per day. From there, supporters identified and implemented projects to throttle back humanity’s contribution to the lake’s nutrient levels. Today we find that the quality of the water in the main body of the lake remains high but is still impaired, and is starting to show signs of the change that is underway. The North Arm of the lake bears much more dramatic evidence of increasing nutrient concentrations. Frustrated or resigned observers refer to it, at times, as a eutrophic extension of the otherwise oligotrophic lake. Research continues in the form of two studies, the outcomes of which will influence decision-making for future projects. How much does runoff from the highly-developed slopes above the south shore contribute to the total daily Phosphorus load? If stakeholders diverted the runoff from the lake, how much closer to the approved TMDL would the lake be? How does the nutrient profile along the North Arm relate to the growth of cyanobacteria? Knowing this relationship, can we predict, prevent, or better respond to Blue-green Algal Blooms?